Run Time: 98 Min Rated: 14-A (Canada) R (MPAA) for intense sequences of disturbing violence and terror. 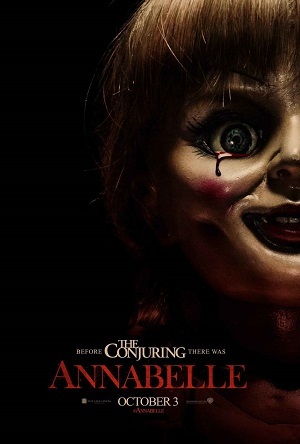 Annabelleis the follow-up to James Wan's horror film The Conjuring (2013). This time out Wan is a producer and not the director; Annabelleis directed byWan's cinematographer from The Conjuring, John R. Leonetti. The Conjuringintroduced viewers to a creepy doll named Annabelle who terrorized a couple of young nursing students in the 1970s.This b-plot (allegedly based on a true story) proved so popular it garnered the production of Annabelle,a film detailing the origins of the possessed doll. Set in 1970 the film’s central young couple, Mia (Annabelle Wallis) and John (Ward Horton),are expecting their first child and experience a tragedy as their next-door neighbours are brutally murdered and they too are assaulted by the murderers. One of the murderers is the neighbours’ estranged daughter who is part of a satanic cult. While barricaded in the baby's room at Mia and John's house, the estranged daughter - named Annabelle - commits suicide while holding an antique doll purchased by John for his wife. What follows is the story of Mia and her family dealing with the ghost of the estranged girl Annabelle trapped in the vintage doll. Along the way they engage the help of their Roman Catholic priest, Father Perez (Tony Amendola), and a local book store owner (Alfre Woodard) who befriends Mia. It's determined that the doll isn't haunted by a ghost but rather is controlled by a demon who wants to steal souls. By the end of the film the doll has changed hands potentially setting things up for yet another film. Most people simply avoid these sorts of films altogether, and in no way is this review a recommendation to run out and see it. However, the film raises questions about the supernatural, particularly about evil within the supernatural. Although Annabelleand The Conjuringprovide answers to supernatural questions concerning death, demons and the nature of evil, do the views expressed by the filmmakers fit with what Christians believe, teach, and confess? As to the question of death, Annabellepresents a world view where, on some level, the dead can remain in the world as ghosts. While this view is described in Scripture, the Bible doesn't teach it as the natural state of things after death. Apart from the Biblical teaching that the spirit of the deceased leaves their body, Annabelledoesn't present a Christian view of death even though it's set in a Roman Catholic milieu. Truly, the film has more in common with the depiction of spirits within Animism popularized by movies like Ju-on: The Grudge (2002) or Ringu: Ring (1998). When it comes to demons Annabelle starts hitting a little closer to the Biblical mark. In the end what's standing behind the doll isn't a "ghost" but rather a demon. The film is a little vague as to the relationship between the demon and the ghost but it is clear the demon is the true threat. It’s never clear whether the ghost is controlled by the demon or if the ghost is an illusion created by the demon. Luther in the Smalcald Articles while talking about abuses in the Roman Catholic Mass says that,"evil spirits have produced many wicked tricks by appearing as the souls of the departed, and with unspeakable lies and tricks demanded Masses, vigils, pilgrimages, and other alms." In Annabellethe demon demands a soul to devour, but the catch is that the soul can't be taken, it has to be offered up. Father Perez warns the couple that the devil is a deceiver, the demon will work to deceive them into offering their souls, and that demons are hungry for souls to devour. This echoes what Scripture says when Satan is described as "the deceiver of the whole world," and "a murderer from the beginning," and "the father of lies," "[prowling] around like a roaring lion, seeking someone to devour." What about evil? How does Annabelle tackle this topic? Behind the doll, a deranged suicidal ghost; behind the ghost a demon; and behind the demon evil. Scripturally speaking, demons are described as standing behind idols and people make sacrifices to them. In Annabelle the demon is both evil and demands sacrifice. However,the film misrepresents evil when Father Perez says, “Evil is constant. You cannot destroy what was never created.” Scripture teaches that evil is at its core disobedience to God. Before creation there was nothing in existence that could rebel against God so there was no evil and therefore it was not constant from eternity. The Augsburg Confession lays original sin (the origin of evil in man) at the foot of the fall into sin, therefore it's not a created thing but a by-product of disobedience. While Scripture teaches that evil/sin will be punished eternally in hell, Christians can take comfort that in the new heaven and the new earth God promises that evil and the demons will be removed, and "death will be no more." These enemies of faith are crushed at the foot of the cross. Annabelleis not really interested in any of this. Rather, Father Perez's line of dialogue fits best into Hollywood’s typical concept of eternal dualism: Good and Evil with their horns locked for eternity, which isn't Biblical. In reality it is unlikely a Roman Catholic Priest would fatalistically say such a thing while dealing with the topic of the demonic. Along with other Christian clergy it would be more likely for them to quote James 4:7, "Resist the devil, and he will flee from you", or St. Paul in Romans 12:21, "Do not be overcome by evil, but overcome evil with good." Annabellealso deals with the topic of suicide. Murder and suicide within the film are ways in which a person sacrifices a soul to the demon. Spoiler ahead! (Ifyouplan to see the film andwant to avoidhaving it spoiled stop reading here and come back later. )At the beginning of the film Mia and John are in church listening to Father Perez preach on John 15:13,"Greater love has no one than this, than someone lay down his life for his friends." In his sermon the priest says that God is happy with our sacrifices for others and that personal sacrifices make God smile on us. At the end of the film one of the characters commits suicide to protect Mia and John's daughter Lea from the demon. The character essentially offers their life to spare the lives of others. When this happens, viewers hear Father Perez's sermon over the scene of the suicide, including the quotation from the Gospel of John and the part about God being happy with our sacrifice and smiling down upon it. This is extraordinarily problematic from a Christian perspective; It would be difficult to imagine a Christian approving that line of thinking. Ultimately, John 15:13 is Jesus pointing to His coming crucifixion for our salvation, yet in Annabelleit is used out of context and twisted into something never intended in Scripture. Again, Wan and Leonetti have crafted a film with a rather thin veneer of Christianity; Like The Conjuring,the theological assertions are unreliable. Add to this the overabundance of uninspired horror film stock characters executed with marginal acting skill and Annabelleends up falling short of its goal. While it might be frightening to some viewers it could have been more frightening which is the general intention of a horror film. Apart from a couple “jump scares,”Annabelleis just not that good. The truly horrifying elements within the film are bad preaching and bad theology. The Rev. Ted Giese is associate pastor of Mount Olive Lutheran Church, Regina, Saskatchewan, Canada; a contributor to "Reformation Rush Hour" on KFUO AM Radio, The Canadian Lutheran and Reporter; and movie reviewer for the “Issues, Etc.” radio program. Follow Pastor Giese on Twitter @RevTedGiese. Matthew 14:26, "When the disciples saw [Jesus] walking on the sea, they were terrified, and said, “It is a ghost!” and they cried out in fear. "Mark 6:49, " when they saw [Jesus] walking on the sea they thought it was a ghost, and cried out". Hebrews 9:27"It is appointed for man to die once, and after that comes judgment". Ecclesiastes 12:7 "The dust returns to the earth as it was, and the spirit returns to God who gave it." Concordia: The Lutheran Confessions, Smalcald Articles, Part II, Article II, The Mass, pg. 387. Revelation 12:9, "The great dragon was thrown down, that ancient serpent, who is called the devil and Satan, the deceiver of the whole world—he was thrown down to the earth, and his angels were thrown down with him." Leviticus 17:7, " They shall no more sacrifice their sacrifices to goat demons, after whom they whore. This shall be a statute forever for them throughout their generations." Deuteronomy 32:17, "They sacrificed to demons that were no gods" 1 Corinthians 10:20, "I imply that what pagans sacrifice they offer to demons and not to God. I do not want you to be participants with demons." Concordia: The Lutheran Confessions, Augsburg Confession, Article II, Original Sin, pg 35. Zephaniah 3:15-17"The LORD has taken away the judgments against you; He has cleared away your enemies. The King of Israel, the LORD, is in your midst; you shall never again fear evil. On that day it shall be said to Jerusalem: “Fear not, O Zion; let not your hands grow weak. The LORD your God is in your midst, a Mighty One who will save; He will rejoice over you with gladness; He will quiet you by His love; He will exult over you with loud singing." 2 Peter 2:4 "God did not spare angels when they sinned, but cast them into Tartarus and committed them to chains of gloomy darkness to be kept until the judgment;" Jesus in Matthew 25:41says that "the eternal fire" the lake of fire (Hell) was "prepared for the devil and his angels." In Revelation 20:10, "the devil who had deceived [the nations] was thrown into the lake of fire and sulphur where the beast and the false prophet were, and they will be tormented day and night forever and ever."